My fellow blogger, James Moore, has written a short, but to the point article about what might happen if workers’ comp disappeared tomorrow. The outcome of such an occurrence would not only throw the workers’ comp industry into disarray, but clog up the courts with lawsuits from one end of the country to the other. Without going into any great detail, I will let you the reader, decide for yourself if this is as dire as he predicts, by letting you read his article here. What does this mean for the medical travel industry? It means you need to get your act together, start marketing your services to insurance carriers, employers, insurance brokers so that they are aware that should workers’ comp disappear, there is an alternative to long delays in getting medical care for work-related injuries. Plastic surgery, reconstructive surgery, dental care, and all the other medical services that medical travel currently provides will need to be supplemented by offering orthopedic and occupational injury and illness services that will save employers and carriers money, and provide the injured worker with the best medical care at the lowest cost, with a better outcome. But none of this will matter if the industry does not seize the day, or as the Romans would say, “Carpe Diem”. This market will not come to you; you must go to it. And right now. This entry was posted in Claims, Claims Process, Constitutionality, Employees, Employers, Florida, Insurance, Legal Issues, Litigation Costs, Medical Tourism, Medical Travel, Oklahoma, Opt-out, Surgery, Texas, Workers' Comp, Workers' Compensation and tagged Claims, Employees, Employers, Legal Issues, Medical Tourism, Medical Travel, Opt-Out, Workers' Comp, Workers' Compensation on July 16, 2015 by Transforming Workers' Comp. Stephanie Goldberg reported last week on Business Insurance.com that medical care inflation could cause workers’ comp costs to rise. Citing several sources, including NCCI, Moody’s Analytics and the US Bureau of Labor Statistics, Stephanie said that “increased pressure on medical costs per workers’ comp claim is expected as medical care inflation picks up”, according to a briefing published last week by NCCI. 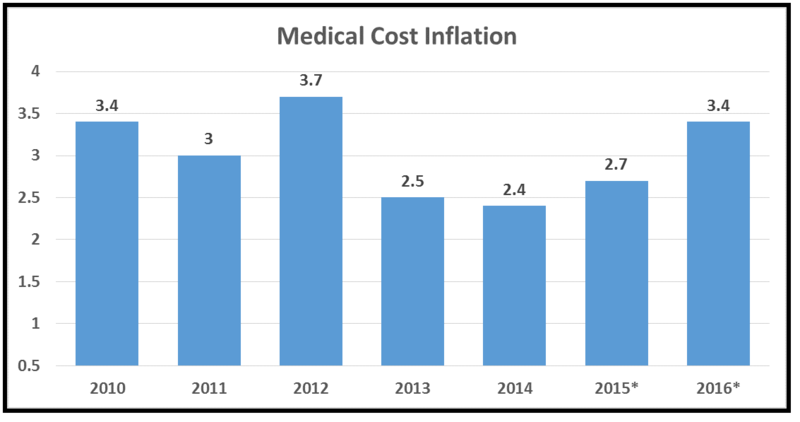 Stephanie also stated that NCCI said that while medical care costs inflation has been muted for the past two years, it is expected to rise at a faster pace, this year and next year. The following chart illustrates this. *2015 and 2016 inflation rates are projected. NCCI said that by measuring only changes in price, medical cost inflation will remain below 4% for both years. That compares with 2.4% in 2014 and 2.5% in 2013. However, price alone is not enough to predict medical costs, according to the sources cited in the article. Factoring changes in price, as well as utilization, a report released in June by PricewaterhouseCoopers, projected a medical cost trend of 6.5% for next year. An earlier projection claimed a 6.8% increase. PwC also said that the medical cost trend is influenced by changes in the price of medical products and services, changes in how often these products and services are used. Other factors include expensive specialty treatments, and investments to guard personal health data. The PwC report does not focus on workers’ comp specifically. When contacted by email by Stephanie, Joe Paduda said that medical benefits could exceed two-thirds of claim costs on a national basis within three years. He also said that in many states, medical benefits already make up more than half of total benefits. I wrote about how we have siloed general medical care and workers’ comp medical care into two different silos in my article, “Betting the Farm”, so Mr. Engles’ observation is accurate. Stephanie’s article focused on what steps workers’ comp payers should take to control higher medical costs per claim, her sources said, and Joe Paduda said that another way they could control medical costs is by identifying and, where they can, direct injured workers to the best providers. It is rare that I ever disagree with Joe, as I have always trusted his reporting on workers’ comp and managed care issues, but as my readers know, I have a better way for workers’ comp payers to control costs. There are other alternatives. Medical travel is one of those alternatives, and it is high time that Americans look beyond our borders for lower cost medical care for injured workers. It is wrong-headed and quite illogical to ignore the facts that have been presented in the Goldberg article, as well as all other articles, reports and surveys of the costs of workers’ comp medical care. And it is also wrong-headed and quite illogical to assume that only Americans practice quality medical care. That is like saying that Japanese and Koreans can’t play baseball, that only Canadians can play hockey, and that Russians and Lithuanians and Croats can’t play basketball, and so on. Our stubborn devotion to “American exceptionalism” has a very high price. If you want to keep paying that price, go ahead, but you’d be foolish to continue do so. The choice is yours, pay higher costs, or look for lower cost health care. Medical travel is the answer. This entry was posted in Claims, Cost Control, Health Care Costs, Inflation, MEDICAL COSTS, Medical Tourism, Medical Travel, NCCI, Workers' Comp, Workers' Compensation and tagged Claims, Costs, Health Care Costs, Inflation, Medical Costs, Medical Tourism, Medical Travel on July 7, 2015 by Transforming Workers' Comp.